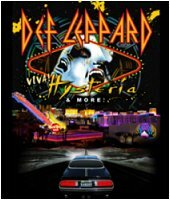 Def Leppard singer Joe Elliott recently spoke to Noise Creep about the VIVA Hysteria! residency in Las Vegas. Joe talked about the upcoming VIVA Hysteria! residency, his early impressions of Las Vegas, touring in the early days, a Pyromania era Vegas story and other bands doing residencies there themselves. The now 11 show run is 14 days away and kicks off on 22nd March at The Joint. "Vegas was a mythical thing for me and the boys." "'Elton is doing a Vegas residency? Surely not!' It got us thinking. Then I came out and sang some stuff when Cheap Trick did their Sgt. Pepper's performances there in 2009. All of a sudden, we were in good company."